The warmer fall weather held out in New England yesterday, allowing us a fun playground adventure with four of our five grandchildren. They were all looking so adorable in their little hipster hats and handknits gifted by friends and family (but alas, not by me). All this cuteness reminded be that I really need to knit for them too! I admit to paying more attention to my work knitting than to my grandchild knitting. With the holidays coming, I am determined to rectify that situation. Time to search the Berroco archives for the best of our easy baby patterns. That’s easy knitting (and crochet) patterns – the babies themselves don’t have to be easy! I went to the pattern search page for the quickest way to find easy baby patterns. Then I used the filters along the left column of the pattern page to narrow my search. 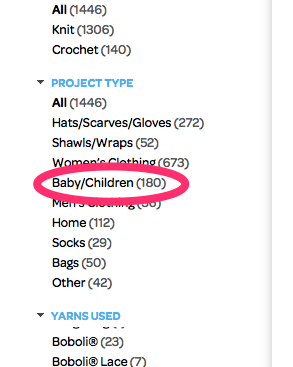 I found some great grandchild gift ideas simply by clicking on the “Baby/Children” under the “Project Type” category. Arshile – I love a classic guernsey on a little one! Battenberg Blanket – Blankets stand the test of time. Citron Blanket – Remember being little and hiding under your towel as if you were invisible? Sofo – Gingham! It’s can be woodsy or girly, depending on the colors you choose. Sunday Best Dress – is just plain pretty. What do you like to knit or crochet for babies? I love the Sunday best dress but there is no pattern as the link takes you to Sofo. Sorry, I goofed. It should be fixed now. That guernsey has a great neck to go over a little one’s head! My mom had a great baby pattern for a worsted weight Irish knit. Wish I had that pattern! Ours spring booklets may hold a happy surprise (or 2) for you! I didn’t mean to imply that we were reprinting this booklet. In fact, it’s still in print. If your LYS doesn’t have it, I Googled it and found that there are on-line stores that carry the booklet. Thanks! LYS does not, so I will google too. Forgive me for jumping to conclusions! I can’t believe you have grandbabies! I didn’t even know you had kids and only found out a while back that you are married. You must have started young–like me! Am sitting here with my amazing and awesome blanket from Nature Knits! Ah, I cheated. I never did have children of my own. I married a man with grown children. I sort of suspected that, but congratulations anyway–and enjoy!